What made you start Muay Thai? and what has kept you going? I first came across real Muay Thai way back in 2000. I was standing across the road opposite a gym on Ko Samui watching the training. A couple of the guys were beckoning me to join them them but I politely declined! To this day I regret that but back then I was just a backpacking beach bum looking for the party! If someone would have told me that 9 years later I would be staying at that camp I would have laughed! I had spent quite a bit of time in Thailand before I started training so I knew about the culture, traditions, sports and of course Muay Thai. In 2005 I began working with someone who had been trained by a Thai and to cut a long story short, I bought a set of pads & he began to show me the basics. After a few months, I joined Praya Pichai Club where I stayed for about 4 & a half years. I then joined Trojan Free fighters in November 2010. I was attracted to the history & culture of the art and I had a thirst for knowledge & became like a sponge! Muay Thai is a real Martial Art derived from a proven battlefield combat system and I was atracted to every aspect of it. It’s a workout for the whole body & mind and both have to be strong. I remember crawling up the stairs on my hands and knees after training, my hips aching from kicking, limping into work next day with bruises and black eyes! What has kept me going is the fact that you never stop learning, it’s amazing fitness & I’ve made some good friends through the sport. I’ll never stop training Muay Thai, I can’t! Why do you think Muay Thai has been so integral to MMA striking? When it comes to stand up fighting Muay Thai is the complete package but the Muay that you see in MMA isn’t like the traditional style. Once you put takedowns into a fight style things change! The stance and the striking is adapted to the sport. 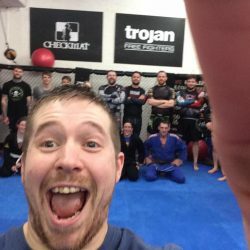 I don’t train MMA so can’t comment too much but I train MMA fighters in my Thai class & we talk about what would work & what wouldn’t. They take what they want from what I show them & adapt it for their game. 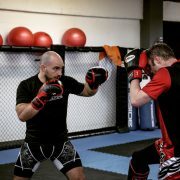 All top MMA gyms have a top Thai coach, for example take a look at Evolve in Singapore. The fact is that there are only a handful of ‘arts’ that work in the octagon Muay Thai being one of them. Lots of martial arts look impressive but they are ‘art’ not ‘martial arts!’…Early days of the UFC showed people what worked, Kung Fu against Kung Fu yeah looks great but in the cage it doesn’t really have a place. A child at school has trust in his/her teacher and feels comfortable approaching them about anything. A good Muay Thai teacher should make students feel that way, be approachable and open, knowledgeable on the subject. Setting a good example and leading from the front are important. I wouldn’t ask any of my students to do something I couldn’t do myself. You need to be self motivated and know how to get the best out of people. Teaching isn’t easy I’ve seen a few people fail over the years through different reasons. You have to get the balance right and remember that each student is on their own journey. Not everyone wants to train & fight, and good fighters don’t always make good teachers and vice versa of course! What would you say to those thinking about starting Muay Thai? Firstly they should ask themselves why they want to do it secondly are they prepared to make sacrifices and changes. If you start training and are serious then trust me a lot of things will change. Your diet & eating habits, your social circle, even your friends. It’s a practice & study and it will change your life. It has massively influenced my life not just by keeping me fit but also the way I like to live. The simple life, without too much care for possessions, to be humble, respectful, all traits from Muay Thai. Train hard & understand the importance of repetition. Don’t rush or try to learn to quick. Above all enjoy it! Finally, what is your favourite Arnie film? This is a tough one! Arnie and Stallone were my childhood heroes. I probably know 90% of the script to predator ha ha! But I’m going to say Commando. I had the poster on my wall!